James Warhola Wants to Inject a Little Humor into Our Political Discourse. Las Vegas, NV, February 22, 2018 --(PR.com)-- James Warhola’s work has encompassed science fiction, fantasy, humor and children’s books, but now the award winning illustrator and MAD Magazine “idiot” has turned his attention to political satire. He is a featured guest at this weekend’s Las Vegas Toy Con at the Circus Circus Hotel and Casino, and he chose this opportunity to unleash his latest creation on the world: a tongue-in-cheek “campaign poster” he hopes might someday rival Shepard Fairey’s “Hope” in popularity. Fresh on the heels of an appearance at Sarasota, Florida’s famous Marie Selby Botanical Gardens, where he waxed nostalgic about his uncle Andy Warhol’s work for the opening of the Gardens’ “Warhol: Flowers In The Factory” exhibit, Warhola now finds himself in Las Vegas, visiting roots of a different sort at the convention’s Gross Card Con as one of the primary perpetrators of Topps’ Garbage Pail Kids. 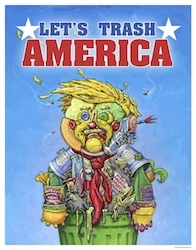 His new poster, “Let’s Trash America” – produced exclusively for the show – is, much like his GPK work, equal parts humorous and horrifying. And perhaps oddly appropriate for these politically charged times we live in. James Warhola will be on hand throughout the weekend talking with fans, signing posters, and discussing his plans to avoid getting into trouble over his work. Like his Pop artist uncle Andy Warhol, James Warhola attended the famous Tam O’Shanter Saturday Art Classes at the Carnegie Museum of Art and graduated from Carnegie Mellon University, but his career in art has taken unique turns all its own. Warhola has created artworks for more than three hundred book jackets, including Stranger in a Strange Land by Robert Heinlein and Neuromancer by William Gibson. In addition, he has been a regular contributor to Mad magazine since 1980, creating both cover and story illustrations, and one of the primary artists for the popular Garbage Pail Kids (GPK) trading card series for Topps.